Remember that Top 5 Diet Books post I wrote back in July? All those books can take a HUGE step backwards. I now have a new favorite nutrition book. 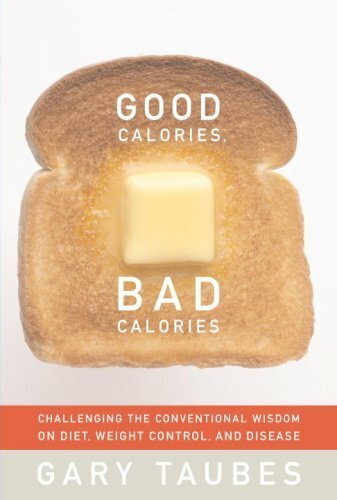 Good Calories, Bad Calories by Gary Taubes is a stellar piece of research. For me this book connects all the dots between the evolutionary nutrition model, my own experiences and a hundred years of medical studies. Good Calories, Bad Calories tells the story of how we came to believe many of myths surrounding nutrition today and what the actual research says. He makes a strong case that the field of nutrition has been politicized and negligent since the 1950s. Without giving too much away, he makes the strongest case against carbohydrates and the current state of public health that I have ever read. How obesity causes overeating and not the other way around. Insulin’s role in stored body fat. The connection between Alzheimer’s Disease and Carbohydrates. When I finished reading the book, I wondered how Taubes amazing research could be communicated to the average person. If the book was dumbed down it wouldn’t have worked. For me the answer is that this book will inspire many nutrition posts in the next year. Many of the concepts that I found to be the most interesting will be expanded and discussed on this blog. Taubes is writing a shorter version of GC,BC for non-nutrition geeks. Don’t know when it is scheduled for publication. Taubes did not deal two important health issues, omega-6 fatty acids and gut microbiota. I gave in and bought it last week. I’ll be starting it this week. I think this is a great book for reference and does make an excellent case in debunking the myths surrounding the causes of heart disease. The problem I have is it seems to take the author to much time to make specific points in a reasonable amount of time, which for me, makes it difficult to continue reading without boredom creeping in. I know its just me because I don’t read books a lot, I prefer DVD’s. I have “FAt Head” reserved from my local library. I’m beginning to believe that a porthouse steak is actually better for a person then say, a bowl of Cherrios. The problem is, this is the only book that makes such a claim that Im aware of, and there are numerous well known doctors out there That constantly recommend avoidly saturated fats religiously and advize more grain consumption. Taubes will be releasing a shorter more user friendly version of GCBC. Digging into GCBC, you will find more researchers that make the same claims. The Primal Blueprint is a great book that is much easier to read than GCBC with more concrete advice. Okay thanks. But here is another question for you. If early man adhered to a paleo diet, which obviously he did for the most part, since refined carb foods didn’t exist. Then his diet must have included not only red meat and vegetables but whole grains as well. So mixing it up might not be as bad as Taubes seems to suggest. I don’t think there were many grains 10,000 years ago. No farming = no grains.